Assemblyman Todd Gloria wants to revamp a little-known county air pollution board, Assemblywoman Shirley Weber has unveiled her revamped police shooting bill and more in our weekly roundup of news from Sacramento. Former Escondido City Councilwoman Marie Waldron is the most powerful Republican in the California Assembly. She oversees a crew of like-minded lawmakers, helping them to raise money and formulate strategy. Increasingly these days, conservatives are stuck in the defensive position. Last month, Assemblyman Brian Maienschein dropped a bomb when he announced he was leaving the GOP. The Assembly Republican Caucus fell to 19. Democrats now have 61 members. United, they don’t need their colleagues on the other side of the aisle to pass major legislation. The Sacramento Report caught up with Waldron to talk about the California Republican Party and its future. From her perspective, the losses in November were not the result of ideas but the ability of Democrats to raise and funnel more money and better communicate. She avoided the looming figure of President Donald Trump. Here’s the discussion, slightly condensed and edited for clarity. You’re stepping into the role of the Assembly Republican leader at an interesting time. The GOP lost a couple seats in the last election and, correct if I’m wrong, Republicans don’t hold any statewide office. Can you give me your sense of what happened? We had a very interesting election with the overlays of Congress, and certainly there was a lot of money that came in — I think over $100 million into some of these congressional seats to try to take back the House [by Democrats]. So we were outspent tremendously going into the election. I think that’s one of the biggest takeaways. And you look at the trickle-down even to Council races and school boards as well. It seems like there are competing visions at the moment for California Republicans to consider. From your perspective, as somebody in a leadership position now, what should the party look like and sound like going forward to reclaim some of the ground that it lost? Certainly, we need to appeal to new constituencies by finding new ways to communicate how Republican policies benefit them. We have very good value systems, and I don’t think we’ve done a good job in the past decades of actually communicating that well and we’ve allowed others to identify us. So that’s one of the things I’m trying to work on — our messaging. We do advocate for millions of Californians who believe in the things we fight for and they feel like they don’t have a voice in state government. So we need to step up and have a voice and actually articulate: Our message is better. We’ve always stood for working people. We stand for getting people employed, higher, better opportunities to enter the workforce. We definitely want to have lower taxes, lower costs of living. I think the affordability in California is way too high. Talking about college affordability, housing affordability. We’re very strong on wanting more housing. Even during my time on the [Escondido] city council, we advocated for housing, and I think there’s been a lot of obstacles put in the way, especially regulations, that caused housing prices to go through the roof, and we need to be able to look at those things and make it more affordable for Californians to live here. So where does President Trump fit into all this? He did lose big in California. Do you feel like it’s wise for the California GOP to continue to back him? We can’t control what happens in Washington. We just continue to focus on our statewide issues and what we can do for our Californians. California is a unique breed [laughs] and we have very different issues. We do what we have to do here. Your statement on Maienschein’s defection the other day was uncharacteristically caustic. It’s been a couple weeks. Do you have any additional thoughts on why he left the party? Well, I’d say I think this has had more to do with his 600-vote margin of victory last a year than any shifting of political belief. I think he felt he had to do what he had to do. But you know, once again, we have a great delegation in San Diego and we’ll continue to. So you don’t fly and your role as the Assembly Republican leader requires a lot of traveling across the state. You’re probably in the car a lot. What do you do to pass the time? What do you listen to? A lot of people say I don’t fly, but I do fly. It’s just more convenient sometimes to drive. But I’m constantly working. I’m listening to current events or listening to various tapes and things. I’m not that technical a lot of times. If my husband’s driving or if I’m on a plane or on the train, I’m doing fundraising. Assemblyman Todd Gloria, backed by environmentalists, has a plan to transform the county’s Air Pollution Control District into a more aggressive regulator. The five-member County Board of Supervisors currently runs the little-known district, which oversees major sources of air pollution – other than cars, which the state regulates. Environmental activists have long argued the district has done a lackluster job, failing to update air pollution assessments or take action against polluters. Diane Takvorian, a member of the state’s Air Pollution Control Board and head of the local nonprofit Environmental Health Coalition, pointed to risk assessments for shipyards along the bay that hadn’t been updated in over a decade. But, as an activist, she stopped trying to lobby the county district to do anything. She said complaints went unheeded by the Republican-majority board. “It’s been a long time since we’ve been there to advocate, because frankly it wasn’t a very good use of time,” Takvorian said. Gloria’s bill would upend the district’s leadership, much as Assemblywoman Lorena Gonzalez upended the leadership of the San Diego Association of Governments or another Gloria bill helped change how supervisors are elected, making Democrats’ chances better in future elections. Under Gloria’s plan, instead of five supervisors, the air district’s board would have 11 members, including only two supervisors. The rest would be three members from the San Diego City Council, which has a Democratic-majority, along with three board members from smaller cities and three members who from the public who are activists or public health experts. 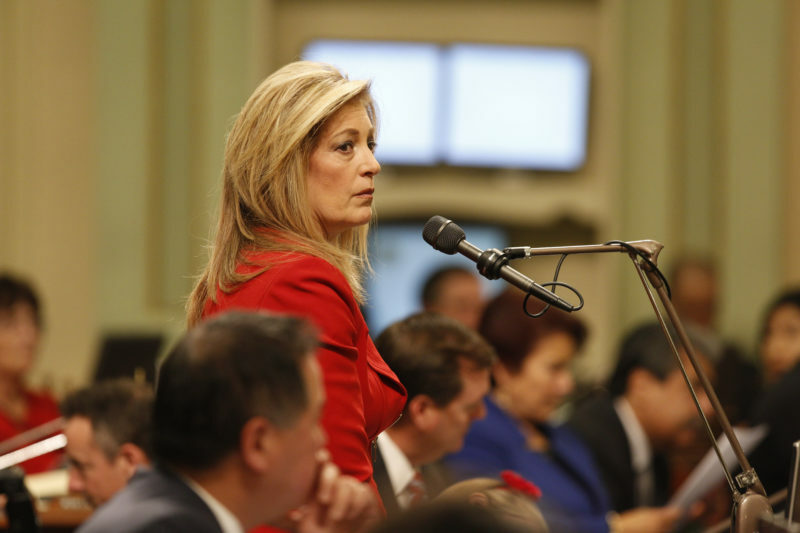 Gloria and others portrayed the bill, AB 432, as a way to help the county get more serious about not only air quality but also climate change. The two issues overlap because burning fossil fuels contributes to both, but are not identical because some pollutants cause public health problems but not climate change. “It’s clear the district can and should do more,” Gloria said. Assemblywoman Shirley Weber has unveiled the revamped version of her bill to change the standards under which police can deploy deadly force. This time around, however, the bill won’t just face opposition from law enforcement, it will face competition from law enforcement, which is offering its own far narrower bill. Though Senate President Pro Tem Toni Atkins had said she would make passing Weber’s bill a priority, she seemed to express support for both measures this week. “While these two pieces of legislation make their way through the process, I will continue to be engaged to find common ground,” Atkins told CALmatters in a statement. I asked Atkins’ office for details on her efforts to advance Weber’s bill since it was held last session. “Senate President pro Tem Atkins’ office facilitated a number of meeting with stakeholders,” Atkins spokeswoman Lizelda Lopez wrote in an email. Meanwhile, police unions are busy fighting another measure too – and a San Diego judge temporarily blocked police misconduct records from being released as a result. The unions are challenging SB 1421, which went into effect Jan. 1, arguing it doesn’t allow the release of records created before that date. The law’s author has said it does. Now, faced with perhaps several million Californians who still lack access to safe and affordable water, the Legislature looks increasingly likely to impose a statewide tax to fund more water projects. In a legislative hearing this week, Wade Crowfoot, the new director of the state’s Natural Resources Agency, said Gov. Gavin Newsom wants a solution this year to this “crisis” this year. Right now, some rural districts don’t have the right equipment to ensure water is safe and paying for that equipment would increase rates so much their residents couldn’t afford the water. Unlike most of the bond money, money from a new “water tax” could be used for ongoing operations and repairs. Even communities that get a new water treatment plant thanks to bond money still lack the money to keep it running. Crowfoot said the state could also push rural districts to merge with each other in an effort to create economies of scale. Urban water districts, including many in the San Diego region, have opposed the tax because they might end up being responsible for collecting the new revenue – which could require more administrative overhead at hundreds of agencies across the state and also make them subject to ratepayer ire for higher bills. The tax would be about $1 per month and most proposals include exemptions for low-income ratepayers. “There is legitimate risk that this could result in political backlash at the local level, with regional and local water agencies potentially losing the political support of their communities, even if such changes are mandated by new federal or state law,” Mark Watton, the general manager of the Otay Water District, wrote to the state. Some state lawmakers seemed concern that the tax wouldn’t raise enough money right away to fix everybody’s problems. “It’s like a competition of who’s got the dirtiest water will go first,” said Assemblyman Eduardo Garcia, a Riverside County Democrat. Assemblyman Devon Mathis, a Republican from an area of the Central Valley where one community ran out of water, argued that instead of a new tax that could only fund projects over time, the state need to redirect a chunk of its existing budget to fund needed upgrades immediately. Assemblywoman Lorena Gonzalez made it official this week: She announced she will run for secretary of state in 2022 (and will seek re-election to the Assembly in 2020). You might remember I asked her whether she was eyeing the secretary of state role back at a live podcast taping in July. She said she was “probably” going to run. On Monday, she announced she’d filed a notice of intent to run, and said in an email to supporters that she was staking an early claim because of the historic nature of her candidacy – she’d be the first Latina elected to statewide office. Meanwhile, Gonzalez’s past and current efforts to expand voter access – one of her primary roles if she won the job – were in the news this week. State officials said they’ll investigate whether problems with the DMV’s automatic voter registration resulted in votes being wrongly rejected or results of races being impacted by the problems. It’s the latest bit of bad press for the rollout of the Motor Voter Law, which Gonzalez wrote and that went into effect last year. Gonzalez also announced a new bill this week, AB 363, that would expand the locations at which residents could vote early. Right now, most counties only allow early voting at the local Registrar of Voters. Gonzalez’s bill would require more early voting locations throughout communities. The U-T editorial board supports a plan to create a state public records ombudsman.